Pontus and Syria became Roman provinces. Judea became client state of Rome and Kingdom of Armenia became an ally of Rome. The Third Mithridatic War (73–63 BC) was the last and longest of three Mithridatic Wars and was fought between Mithridates VI of Pontus, who was joined by his allies, and the Roman Republic. The war ended in defeat for Mithridates, ending the Pontic Kingdom, and resulted in the Kingdom of Armenia becoming an allied client state of Rome. The period between the Second and Third wars of Rome and the Pontic Kingdom (81–75 BC) is discussed under the Kingdom of Pontus. There it can be seen how the long piracy wars were a development out of the First Mithridatic War and especially of the alliance between Mithridates VI and Sertorius, which in joining those two threats into a unity much larger than its parts had the serious potential of overturning Roman power. The immediate cause of the Third War was the bequest to Rome by King Nicomedes IV of Bithynia of his kingdom upon his death (74 BC). Having launched an attack at the same time as a revolt by Sertorius swept through the Spanish provinces, Mithridates was initially virtually unopposed. The Senate responded by sending the consuls Lucius Licinius Lucullus and Marcus Aurelius Cotta to deal with the Pontic threat. The only other possible general for such an important command, Pompey, was in Hispania to help Metellus Pius crush the revolt led by Sertorius. Lucullus was sent to govern Cilicia and Cotta to Bithynia. The original plan was that Cotta should tie down Mithridates' fleet, while Lucullus attacked by land. Cotta was therefore ordered to station his fleet at Chalcedon, while Lucullus marched through Phrygia with the intention of invading Pontus. Lucullus had not advanced far when news came through that Mithridates had made a rapid march westward, attacked and defeated Cotta at the battle of Chalcedon, and forced him to flee behind the walls of Chalcedon. Sixty-four Roman ships had been captured or burnt, and Cotta had lost three thousand men. There Cotta was forced to remain until Lucullus could come to his rescue. Having made his way to Nicomedia, Cotta watched in frustration as Mithridates, after destroying his fleet, marched on to besiege Cyzicus. During the siege Lucullus and his army arrived and started a counter-siege of the army of Mithridates (see: Siege of Cyzicus). Mithridates' cavalry was ambushed at the river Rhyndacus (see: battle of the Rhyndacus) while the rest of his army became trapped on the Cyzican peninsula. Famine and plague and did their work forcing Mithridates to lift the siege and return to Pontus. Lucullus marched after Mithridates' army and slaughtered a great many of his soldiers (20,000 were killed while crossing the river Granicus). After the Battle of Cabira in Pontus, Mithridates fled to Armenia and his army disintegrated. Joined by Lucullus at Nicomedia in 73 BC, Cotta was assigned the task of securing Lucullus' rear by taking the town of Heraclea, which Mithridates had reinforced with 4,000 troops. After reducing the Pontic coast, Cotta began besieging Heraclea, which took him two years to complete, sacking the city in 71 BC. During this time he was forced to dismiss one of his quaestors, P. Oppius, charging him with bribery and conspiracy. While Lucullus stayed in the East, Cotta returned to Rome in 70 BC, where he at first was widely acclaimed for his victory at Heraclea. However, around 67 BC he was accused of appropriation of war booty by Gaius Papirius Carbo. He was convicted of the offence and expelled from the Senate. Tigranes the Great's empire c. 80 BC. Upon his arrival, Lucullus met up with Roman forces which had been campaigning in Asia Minor. In 69 BC Lucullus led a campaign into Armenia against Tigranes the Great, Mithridates' son-in-law and ally, to whom Mithridates had fled after Cabeira. He began a siege of the new Armenian imperial capital of Tigranocerta in the Arzenene district. Tigranes returned from mopping up a Seleucid rebellion in Syria with his main host, and sought battle with the Romans. Lucullus' army annihilated the Armenian host, despite odds of about more than two to one against him. This was the famous battle of Tigranocerta. It was fought on the same (pre-Julian) calendar date as the Roman disaster at Arausio 36 years earlier, the day before the Nones of October according to the reckoning of the time (or October 6), which is Julian October 16, 69 BC. Tigranes then retired to the northern regions of his kingdom to gather another army and defend his hereditary capital of Artaxata. Meanwhile, Lucullus moved off south-eastwards to the kingdom of the Kurds (Korduene) on the frontiers of the Armenian and Parthian empires. During the winter of 69-68 BC both sides opened negotiations with the Parthian king, Arsaces XVI, who was presently defending himself against a major onslaught from his rival Phraates III coming from Bactria and the far east. In the summer of 68 BC Lucullus marched against Tigranes and crossed the Anti-Taurus range heading for the old Armenian capital Artaxata. Once again Tigranes was provoked to attack and in a major battle at the Aratsani River Lucullus defeated the Armenian army. Soon he left this campaign and when winter came on early in the Armenian tablelands, his troops mutinied, refusing to go further, and he was forced to withdraw southwards back into Arzenene. From there he proceeded back down through Korduene into old Assyria and in the late autumn and early winter besieged and took Nisibis, the main Armenian fortress city in Northern Mesopotamia. During the winter of 68-67 BC at Nisibis, his authority over his army was more seriously undermined by the efforts of his young brother-in-law Publius Clodius Pulcher, apparently acting in the interests and pay of Pompey the Great, who was eager to succeed Lucullus in the eastern command. After mutiny spread in the legions with the troops refusing to obey Lucullus' commands, the senate sent Pompey to succeed Lucullus. This lull allowed Mithridates and Tigranes to retake part of their respective kingdoms. On the approach of Pompey, Mithridates retreated into the centre of his kingdom trying to stretch and cut off the Roman supply lines but this strategy did not work (Pompey excelled at logistics). Eventually Pompey cornered and he defeated the king at the river Lycus (see: battle of Lycus). As Tigranes II of Armenia, his son-in-law, refused to receive him into his dominions (Greater Armenia), Mithridates fled to Colchis, and thence made his way to his own dominions in the Cimmerian Bosporus. Pompey marched against Tigranes, whose kingdom and authority were now severely weakened. Tigranes then sued for peace and met with Pompey to plead a cessation of hostilities. 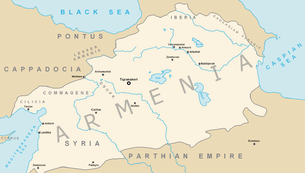 The Armenian Kingdom became an allied client state of Rome. From Armenia, Pompey marched north against the Caucasian tribes and kingdoms who still supported Mithridates. In 65 BC, Pompey had set out in pursuit of Mithridates, meeting opposition from the Albanians who tried to overrun his camps and the Iberians whom he defeated at the battle of the Pelorus. After defeating the Albanians and Iberians he advanced into Colchis as far as Phasis, where he met up with Servilius, the admiral of his Euxine fleet. From Phasis, Pompey marched east again for he had heard the Iberians were gathering their army again, he caught them at the river Abas where he decisively defeated them (see: battle of Abas). 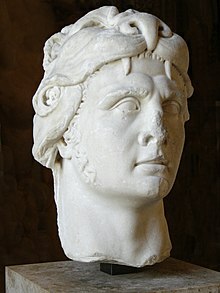 After his defeat by Pompey in 65 BC, Mithridates VI fled with a small army from Colchis to Crimea and attempted to raise yet another army to take on the Romans but failed to do so. In 63 BC, he withdrew to the citadel in Panticapaeum. His eldest son, Machares, now king of Cimmerian Bosporus, whose kingdom had been reorganized by the Romans, was unwilling to aid his father. Mithridates had Machares murdered and took the throne of the Bosporan Kingdom, intent on retaking Pontus from the Romans. His younger son, Pharnaces II, backed by a disgruntled and war weary populace, led a rebellion against his father. This betrayal, after the decisive defeat in battle, hurt Mithridates more than any other and seeing his loss of authority he attempted suicide by poison. The attempt failed as he had gained immunity to various poisons from taking tiny doses of all available poisons throughout his life to guard against assassination. According to Appian's Roman History, he then ordered his Gallic bodyguard and friend, Bituitus, to kill him by the sword: Mithridates' body was buried in either Sinope or Amaseia, on the orders of Pompey himself. ^ Hojte, Jakob Munk. "The Death and Burial of Mithridates VI". Retrieved 3 February 2015. Anderson, J G C: "Pompey's Campaign against Mithradates", JRS 12 (1922), 99ff. This page was last edited on 5 April 2019, at 23:43 (UTC).